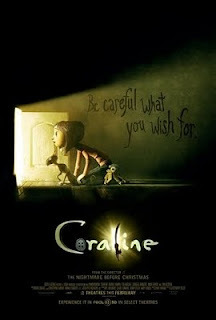 Watched Coraline over the weekend and I loved it! It's a stop-motion horror-fantasy film based on Neil Gaiman's novel. I can't recall where I first read about it but I knew right away I wanted to watch it. I even had the urge to buy the book beforehand but refrained myself as it was a pretty slim book but not with a "slim" price tag. At first I thought Coraline would be somewhat the imagination of Coraline herself ala Pan's Labyrinth (which I also find very interesting) as they both shared similar secret-door-plots. Turned out it was all very real for Coraline. Refreshing indeed. The stop-motion work looked super complicated but the outcome awesome; so much so that Coraline was a nominee of the Best Animated Feature in the 2009 Oscar. The story is well woven and you can totally feel the excitement, the awe, the funnies, and definitely the creepiness. I don't think I can look at rag dolls with buttons for eyes the same way again! Lastly may this film be a warning to all; don't go opening secret, sealed doors -- if there were nothing to hide, they wouldn't have been sealed off in the first place! it's a great creepy story..neil gaiman is a very good writer.